We describe a novel infection-responsive coating for urinary catheters that provides a clear visual early warning of Proteus mirabilis infection and subsequent blockage. The crystalline biofilms of P. mirabilis can cause serious complications for patients undergoing long-term bladder catheterisation. Healthy urine is around pH 6, bacterial urease increases urine pH leading to the precipitation of calcium and magnesium deposits from the urine, resulting in dense crystalline biofilms on the catheter surface that blocks urine flow. The coating is a dual layered system in which the lower poly(vinyl alcohol) layer contains the self-quenching dye carboxyfluorescein. This is capped by an upper layer of the pH responsive polymer poly(methyl methacrylate-co-methacrylic acid) (Eudragit S100®). Elevation of urinary pH (>pH 7) dissolves the Eudragit layer, releasing the dye to provide a clear visual warning of impending blockage. This dataset present raw data from the trial of the prototype catheter coatings within the in vitro bladder model system. The data presented details the change in bacterial biomass within residual bladder urine over time, as well as the consequent changes in urine pH and fluorescence output as a result of coating dissolution. Milo, S., Thet, N., Liu, D., Nzakizwanayo, J., Jones, B., Jenkins, T., 2017. Dataset for 'An in-situ infection detection sensor coating for urinary catheters'. University of Bath Research Data Archive. https://doi.org/10.15125/BATH-00429. 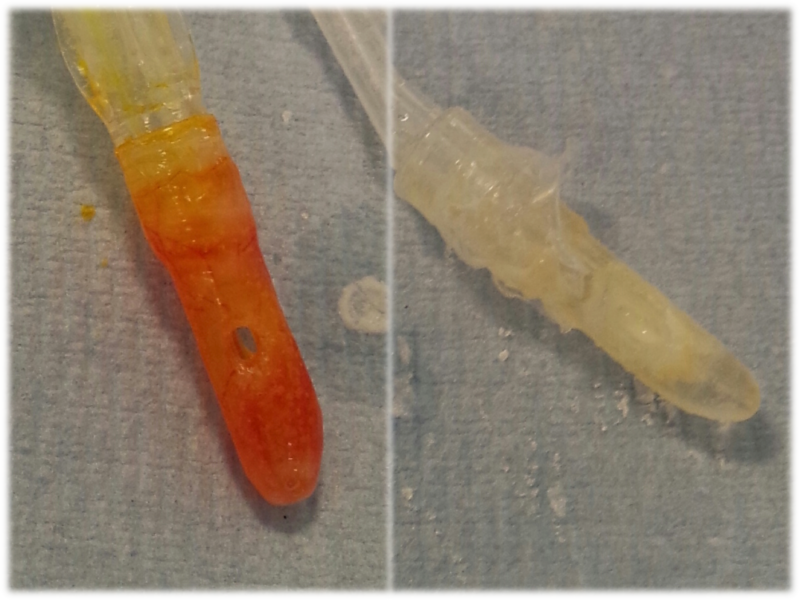 Catheters removed from bladder models infected with P.mirabilis with coating (left) and without coating (right). Images of residual urine within bladder models from models containing coated catheters inoculates with P. mirabilis and E. coli, as well as the uninoculated control. Measurement of bacterial count within bladder models by measuring CFU/ml at various time points after serial dilution into PBS buffer and plating on NSLB agar. Visual evaluation of coating release into artificial urine. Evaluation of fluorescent output with time using plate reader endpoint measurements. All data were processed in GraphPad Prism software. Graphs were plotted and statistical analysis (2-way ANOVA) were perfomed within the same software. Milo, S., Thet, N. T., Liu, D., Nzakizwanayo, J., Jones, B. V. and Jenkins, A. T. A., 2016. An in-situ infection detection sensor coating for urinary catheters. Biosensors and Bioelectronics, 81, pp.166-172. Available from: https://doi.org/10.1016/j.bios.2016.02.059.